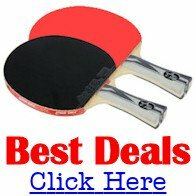 Is Butterfly table tennis equipment the best in the world? Butterfly table tennis equipment is probably the most well known brand of table tennis equipment in the world. The company - Tamasu Company Ltd - was founded by the Japanese international player Hikosuke Tamasu on the 19th December 1950. Butterfly now manufacture world class table tennis equipment which is endorsed by many leading international players ... and it's sold all around the world. Butterfly ... what's in a name? Hikosuke Tamasu chose the brand name Butterfly because the butterfly was an image of peace and beauty throughout the world. This was in stark contrast to the horrible experiences he'd witnessed during World War Two. In 1945 as a young soldier, he was only 2km away from Hiroshima when the atomic bomb was dropped on Japan. In the decades that followed, he tried very hard to diplomatically maintain friendly relations with all the nations in the world as he built up his company. Tamasu's philosophy was that every player was different and that every player had his strengths and weaknesses. He therefore wanted to help players to emphasize their individuality. After showing Butterfly products at the Japan Industrial Exhibition in Peking in 1953, many of the Chinese world stars, as well as the top European players, were playing with Butterfly equipment. But his first success was in the early 1960s with the rubbers Allround D13 and Tempest D13. In 1967, the Butterfly table tennis company launched their Sriver rubber ... one of the most popular rubbers of all-time ... and it's still used by many of the top players today. Sriver rubber brought the company international recognition and in the early 1970s, Tamasu Butterfly Europe was founded in Moers, Germany. But even though this rubber has been so successful ... and used by many world champions ... they're still striving to improve it. In fact, since 1983 Butterfly table tennis have had their own training and research center in Tokyo where highly qualified scientists co-operate with world class players and coaches to further develop their table tennis rubbers and blades. Proof of their success so far is that, for many years, Butterfly rubbers and blades have been used by more than half of the participants at most World Championships and European Championships. Although rubbers and blades are Butterfly's main products, they also supply a wide range of other high quality equipment such as tables, clothing, shoes and accessories. Indeed, Butterfly's motto is ... Quality and service come first. At the start, Hikosuke Tamasu was the Managing Director of the company, whilst his father was President. However, in the early 1990s he appointed his son Kimihiko to lead the company. Subsequently, Hikosuke passed away in 2004 at the age of 83, having been born in Yanai, Japan on 20 August 1920. Two years after his death, Kimihiko went through every article that his father had left and decided to donate the items that were most important to him, and the most valuable to the table tennis world, to the International Table Tennis Federation's Museum in Lausanne, Switzerland. This included an extensive pin collection, books, early Butterfly magazines, a selection of Butterfly rackets together with some personal items including photographs. Even the heavy Nikon camera, which always accompanied Hikosuke wherever he travelled, was donated. The Butterfly table tennis company decided to focus on young players ... so they signed up some leading young European players, giving them long term contracts to promote Butterfly table tennis products. Two of these players were Germany's Timo Boll and Denmark's Michael Maze. "At age 10 I had a contract with another brand, but they didn't want to extend it. The reason given was that I had asked for 28 instead of 8 sheets of rubber. Obviously this was too many for them and so Butterfly took over. This was the beginning of a super partnership." Men - Zhang Jike (China), Timo Boll (Germany), Joo Se Hyuk (Korea Republic), Kalinikos Kreanga (Greece), Michael Maze (Denmark), Chuan Chih-Yuan (Chinese Taipei), Oh Sang Eun (Korea Republic), Werner Schlager (Austria), Mitzutani Jun (Japan), Bastian Steger (Germany), Seiya Kishikawa (Japan), Kaii Yoshida (Japan), Kenta Matsudaira (Japan), Ryu Seung Min (South Korea), Kim Min Seok (South Korea), Lee Sang Su (South Korea), Lee Jung Woo (South Korea), Jiang Tianyi (Hong Kong China), Adrien Mattenet (France) and Adrian Crisan (Romania). Women - Liu Shiwen (China), Tie Yana (Hong Kong China), Gao Jun (USA), Krisztina Toth (Hungary), Viktoria Pavlovich (Belarus), Veronika Pavlovich (Belarus), Jiang Huajun (Hong Kong China), Cheng I-Ching (Chinese Taipei), Huang Yi-Hua (Chinese Taipei), Yu Mengyu (Singapore), Sun Beibei (Singapore), Fujii Hiroko (Japan), Shen Yanfei (Spain), Sara Ramirez (Spain), Hu Melek (Turkey), Daniela Dodean (Romania), Iveta Vacenovska (Czech Republic), Renata Strbikova (Czech Republic), Nikoleta Stefanova (Italy), Irene Ivancan (Germany) and Carole Grundisch (France). from my table tennis store. Want to know more about Butterfly TT equipment?